Your boss deserves respect and empathy just as much as the next person. Invest in your relationship with your manager as you would in any other critical professional one, be it with clients, co-workers or subordinates. No business school offers a course on it. Books on management do not cover it (a psychology textbook maybe). There is no HR manual or corporate training to master it. Yet this ignored aspect of management is the cornerstone of a successful career - knowing how to manage your boss. Ironically, while team management is considered a skill, the reverse is often ignored. Have no doubt that the former is just as important as the latter in your career. You do have to perform to be successful. The parameters and the result areas may vary for each role but you need to match the expectations of the management. To deliver, you need to have the team, the resources, the budget and the authority to take decisions. After you do complete your task, you need your output to be recognised and rewarded. There is one factor that is common to all of the above - your manager has control of all of it. It is therefore imperative to learn how to manage this most important resource at your disposal. Fortunately, like any other basic skill, you can learn and improve on it with practice. The basic principles are the same as in managing a team - deliverables, communication and relationship. First, understand what the management expects from you and how can you deliver. Study the job description for your role. If none exists, create one (in writing if possible). Discuss it with your boss. Take cues from your manager about his and the organisation's priorities. Focus on those aspects that directly contribute to your manager's performance appraisal for the year. You ought to have a list of prioritised goals once you are done. Then, be recognised as a person who can identify and solve problems. Try to minimise management overhead or the burden you place on your superior's time and resources. Also make sure to document everything as per company policy. The second is communication. Keep in mind that any leader would like to be kept informed. He would not be happy to get news of his team (bad and good) from external sources. So analyse relevant data regularly and keep him informed so that he can make fast decisions. Facts and figures must be accurate and opinions balanced. It won't take a lot to undermine your superior's trust in your intentions and abilities. This will sabotage your career faster than any failed project. Seek your boss's opinion only when you genuinely require it. When you do get an opinion, do follow it up. Also, in communication with others, do not undermine your manager's authority. Complaining about your superior can only serve to weaken your own credibility. 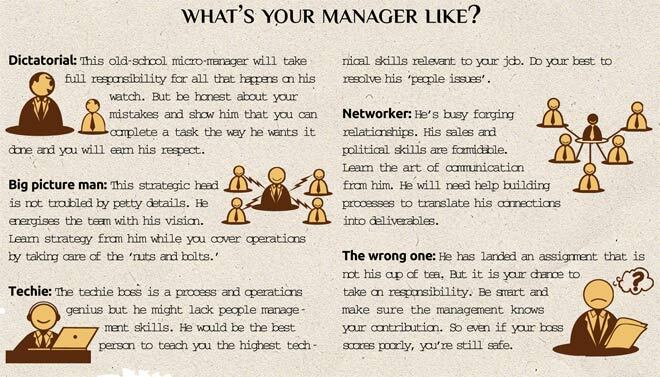 The last aspect is your relationship with your manager. Invest in it as you would invest in any other critical professional one, be it with clients, co-workers or subordinates. To keep it positive analyse both yourself and your boss. Your individual strengths and weaknesses will determine the tone of the relationship. Your boss deserves respect and empathy just as much as the next person. This includes appreciation for his contributions and sensitivity while sharing criticism. Appreciate that the organisation has chosen to give him greater administrative powers in order to meet certain common goals. However, do not ignore the influence of your contributions and attitude in completing or sabotaging your organisation's goals. Seek inputs from others to improve and build on your relationship . While you cannot dictate your boss's behaviour, you do have complete control over your own actions and reactions. The best relationships can last beyond a single assignment or even an organisation. You could gain lifelong mentors or friends providing tangible value and support throughout your career. Of course, sometimes good intentions and management skills come to nought against difficult managers. Studies have found that bad managers are a cause for people resigning, more than any other in fact. Before you take that step, and sometimes you have to, know that it should be the very last option. There are ways to deal with such a situation (Not Done Boss, October 2011). At the same time, start interacting with senior managers in the organisation. Make sure that your employers, including your manager's senior, is familiar with you and your contributions. This is the best insurance policy you can have if your relationship with your immediate senior sours.